A group of 21 arts and cultural organisations across Birmingham joined forces to form Culture Central – a collective voice and development agency for culture and the creative industries. 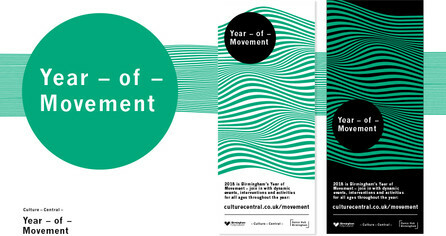 Supercool created Culture Central’s brand identity and website. The minimalist look is centred around the idea of clear, joined-up thinking – with black and white colour palette, and pared-back editorial style putting the focus squarely on content. Culture Central’s website houses articles, opinion pieces and event listings, alongside links to third party news articles celebrating the city’s vivid arts and cultural scene. It's easy to share snippets of content – just select text, and immediately post to Twitter or Facebook, or send a link to someone via email. We also created sister brands Dance Hub Birmingham, and Year of Movement – a 12-month programme of sporting and cultural events aimed at getting people active.